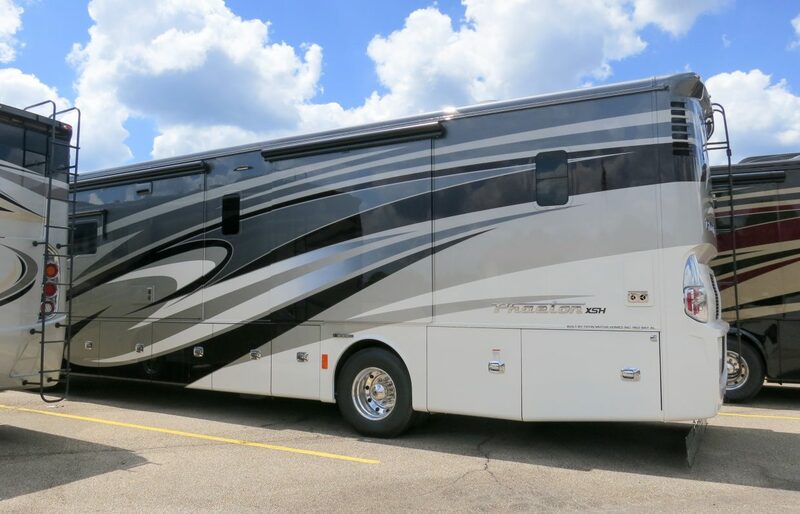 In case you missed it, we’re upgrading to a new motorhome! In our last two blog posts we discussed what we’re doing and why, and how our new diesel chassis differs from Rover’s gas chassis. In this post we’ll talk about some of the ways our new house (the box we live in, sitting on top of the chassis) differs. 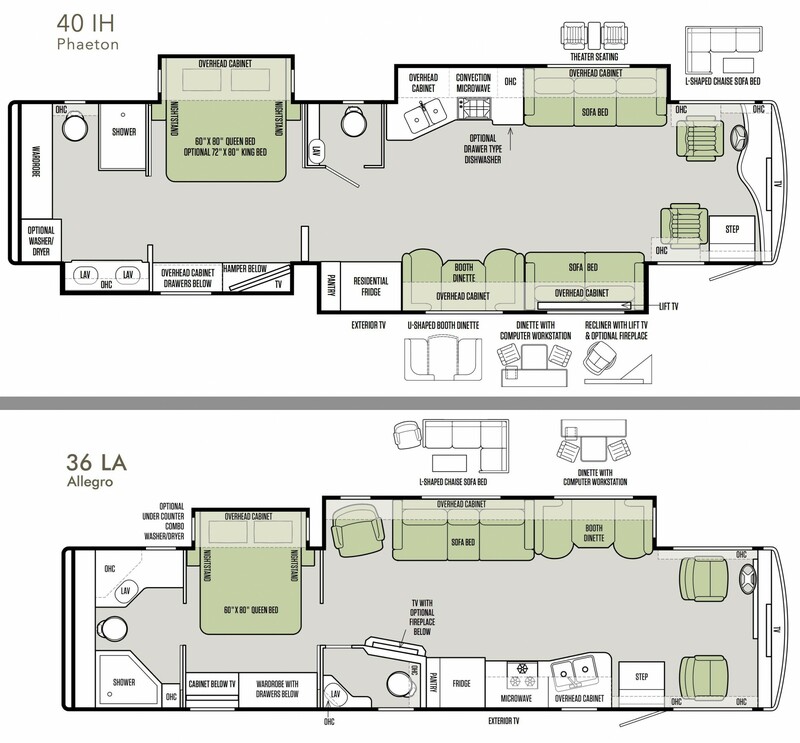 New 40IH and old 36LA floorplans. While those two slide-outs on the passenger side will cut into our outdoor campsite space, they provide some great indoor space. We also like some of the floor plan changes, such as having our dinette on the passenger side so we can see our campsite (rather than our neighbor’s campsite) while eating, and a more unified living room area in the front (which includes the swiveling front seats). The extra space, and the ability to carry lots of additional weight, also translates into quite a few extra “luxury” amenities. While none are really necessary, we have to admit we’re looking forward to quite a few of them! We’ll soon have a king size bed (Opie takes up a lot of space), a dishwasher, separate clothes washer and dryer, a big kitchen pantry, a larger wardrobe, a pull-out kitchen counter extension, induction cooktop, and more. 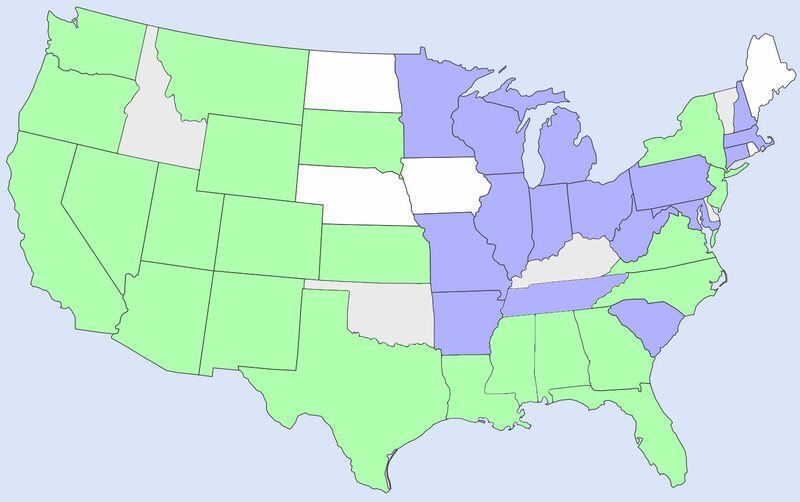 We’ve learned over the years that in the summer an RV is basically a big solar oven that’s difficult to keep cool (though Yuma in July was probably an unfair test), and in the winter it can be drafty inside, with a very cold floor due to being up off the ground with cold air flowing underneath us. 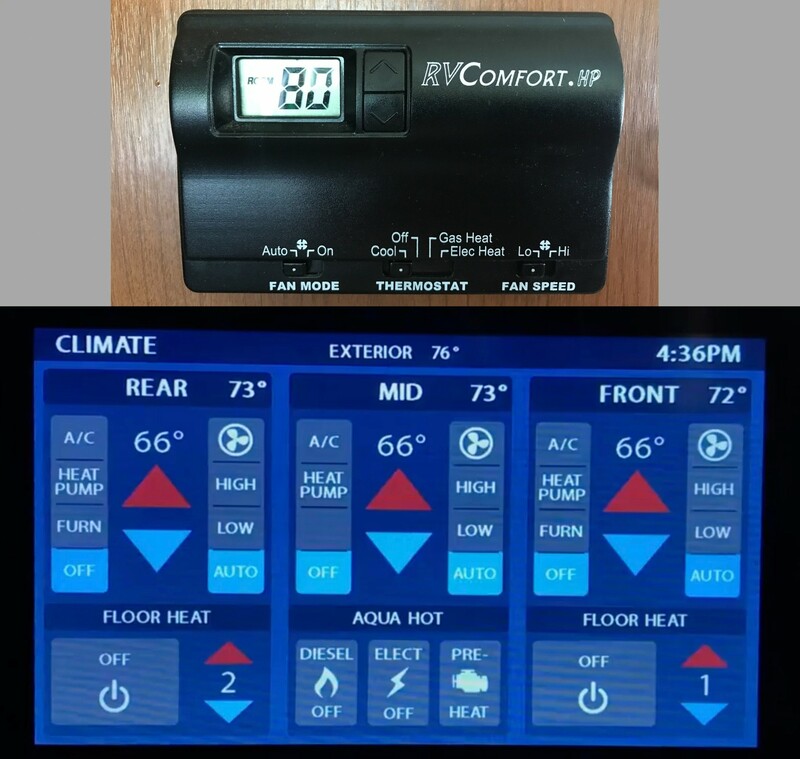 We’ll now have three air conditioners with three heat pumps (vs. two and one in Rover), a diesel-fired AquaHot hydronic heat system that also provides unlimited instant hot water (no more involuntary cold showers), and double-pane flush-mounted windows. Oh, and heated floors! Yep, now we’re really roughing it! 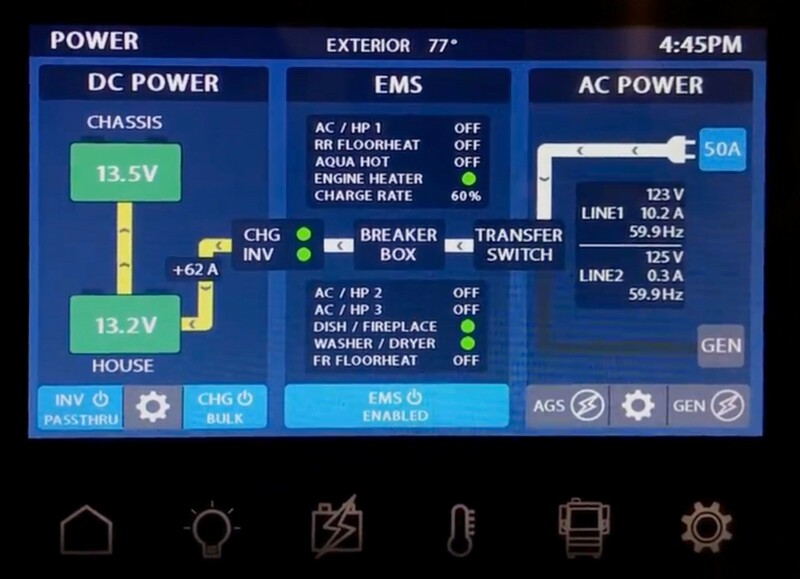 Monitoring and controlling the RV electrical systems. All this extra technology does come at a cost – increased electrical consumption. Fortunately, the Phaeton’s house battery bank is much heftier than Rover’s: 900 amp-hours (Ah) of AGM batteries, vs. 400 Ah of flooded batteries in Rover. In real-world usage that’s three times the capacity, since we can safely draw the AGM batteries down further than the flooded batteries, which we try to never draw below 50%. We also ordered an upgraded solar pre-wire package from Tiffin so we’ll have nice heavy solar wiring from the roof to the battery compartment for when we decide to add solar panels again. Of course, one of the most important (and toughest) decisions is always what color to get! Typically each model RV only comes in eight or so different color schemes, where each scheme comprises four different colors arranged in swirls and swoops. When we ordered Rover in 2013 we got a tip that there was a secret “unpublished” color scheme called “NASA” which was monochrome. Since nearly every motorhome we had seen was a combination of brown and gold, we opted for NASA. Fast forward to 2018 and NASA is an official color scheme and we see monochrome motorhomes everywhere now! 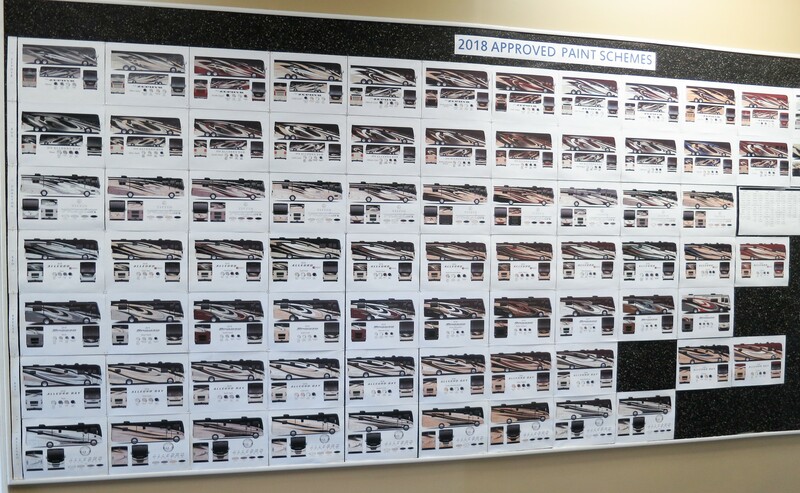 For the 2018 Phaeton, there were two color schemes that we liked: Maroon Coral and White Mahogany, which is pictured at the top of this blog post. But while we were visiting the Tiffin paint factory we spotted an Allegro Bus (a higher-end motorhome than the Phaeton) with a beautiful deep blue stripe across it. 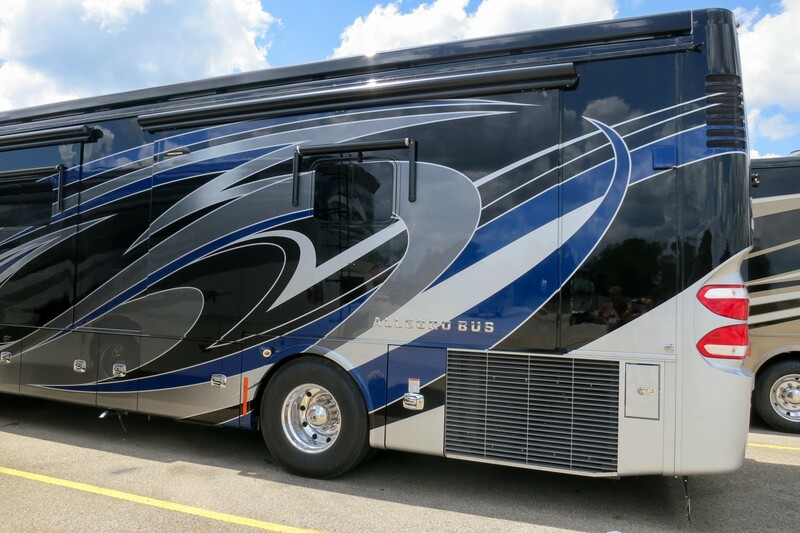 We haven’t really seen any blue in motorhomes before, with reds, browns, and golds still being in almost every scheme, so it really caught our eye. The elusive Pacific Blue color on an Allegro Bus. My attempt to mock up the final result in a paint program. We’re really looking forward to watching our build in September! 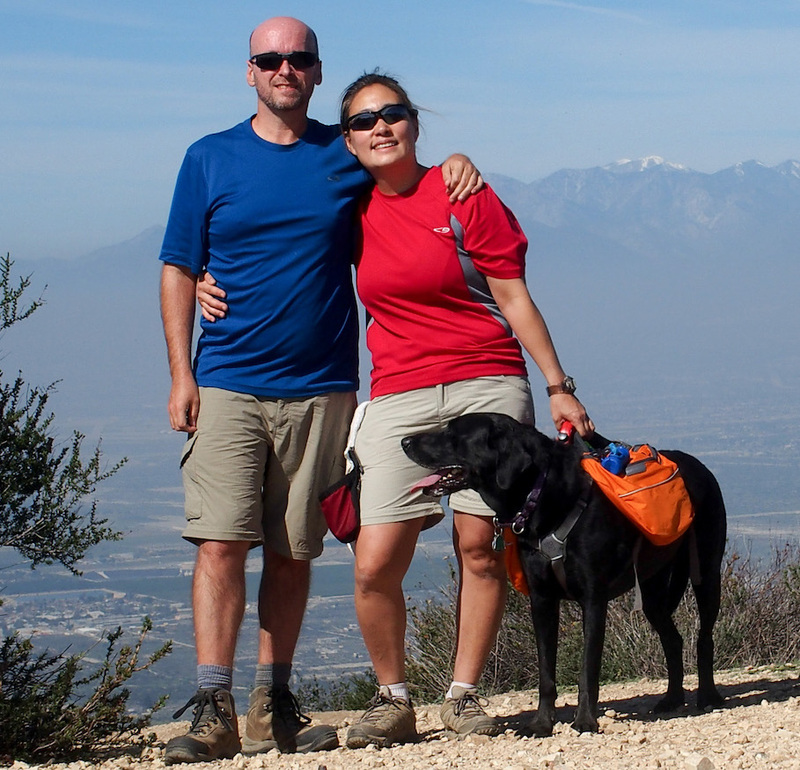 When we watched Rover’s build in early 2014 we often had no idea what we were looking at or what to pay attention to, being new to RVs and motorhomes. This time around with all our experience living, driving, customizing, and repairing Rover, we think we’ll get a lot more out of the build process. Plus, instead of only having three days in Alabama we’ll be there for three weeks and will see far more of the process, including the chassis, painting, and final inspections and quality checks. Check back in with us in September for progress on our build. Hopefully by then we’ll also have chosen a name for our new traveling companion! Note: “Roughing it… smoothly” is Tiffin’s corporate motto. Wow, you guys are really going for it! Blue is my favorite color, and your design looks fantastic. We’ll follow you when you get this beautiful coach on the road and make sure we meet up. Really want to see how you like the AGM batteries and your charging system overall. Enjoy! I have Phaeton envy!! The extra living room space looks great! I like our full slide in the 36UA, if we had the slide on the kitchen side it would be great. Like you I would much rather have the dinette on the camping side. One thing I didn’t think investigate thoroughly enough when I ordered the solar pre-wire was the way the wires were run. There was a set from the roof to the cabinet above the driver’s seat and another from the cabinet to the battery bank. I ended up buying the Magna MPPT solar controller which integrates nicely with the Inverter and because of its size placed it in the bin next to the battery bank. I then had to move the wiring from the battery compartment to the storage bin and connect the two wires in the cabinet above the driver seat. You probably have that all covered by now but thought I would share that just in case. Thanks Ed! Yeah I plan to connect the wires together in the cabin cabinet, and install the controller in the battery compartment if there’s room. Since the batteries are AGM it should be OK to have them there. I guess Tiffin expects folks to only install one panel, in which case putting the controller in the inside cabinet would be fine. I’m thinking 1200 Watts this time around, so even with the upgraded 4 gauge wire I’ll need to serialize panels into sets of two or three panels @ 36V or 54V instead of keeping them all at 18V. And I need to pick an 80A controller. But, we’re not going to worry about all that for a while! What an exciting time it must be for you! Must admit to a slight tinge of new coach envy. Hope you take & post lots of pics this next few weeks! Do you think you will install a Safe-T-Plus or equivalent on this new rig? Not sure. We didn’t have one on the 36LA, so I’m not sure about adding one here either. Yeah, I wasn’t sure how much you had researched this area. Those that have them installed seem to really swear by them, but I was thinking that I would make the call after some time behind the wheel, etc. We love the blue paint scheme, for a second you had us fooled thinking the 40IH had a tag axle option, that would be our dream coach :). 44 is also too much for us. Would you mind sharing how much is the fee for custom color ? Steven, yeah we didn’t really want to longer than 41′ or so. Changing out a color is around MSRP $850 I think. I’m curious about the build process. Do you order from Tiffin and then purchase from a dealer? Also, I don’t like that a stranger drives your coach to the dealer, can you be hired as the driver to take your coach to the dealer? 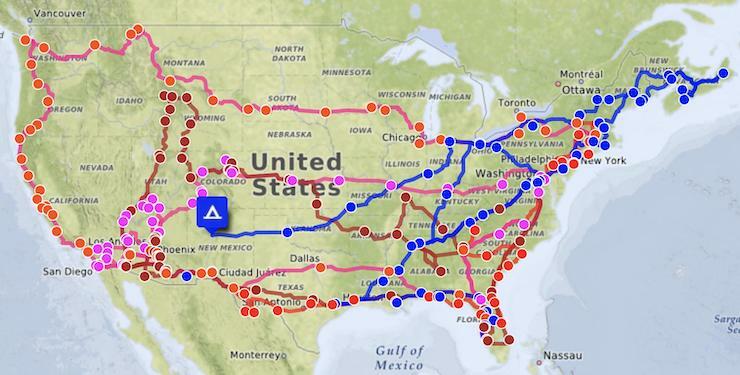 I’m thinking about purchasing a Newmar as close to their plant as possible so the break in miles are driven by me instead of some random driver. Paul, you have to order from a dealer, but you can request your build schedule from Tiffin and then go watch the build. Tiffin hires commercial drivers to deliver the RV to the dealerships – you can’t drive it. 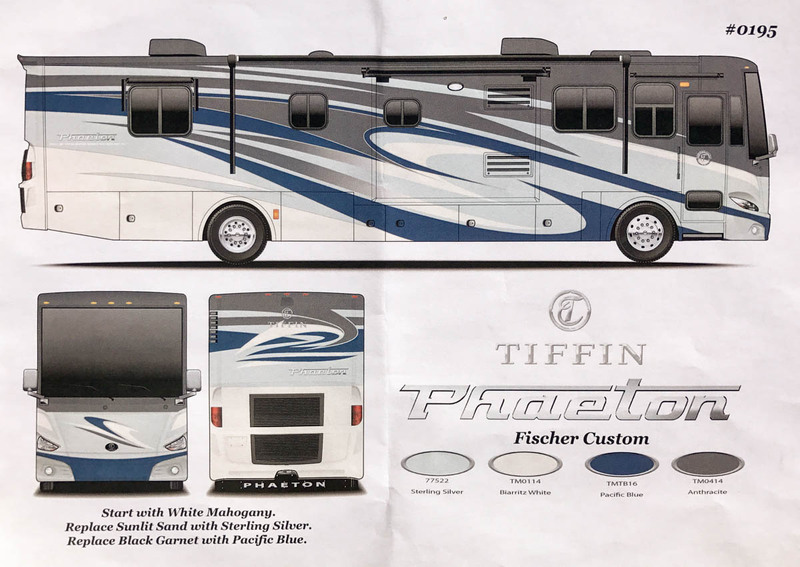 Lots of folks buy at the three dealers closest to Tiffin (Sherman RV, Davis Motorhome, and Marlin Ingram RV) so the RV will have few miles on it, and so they can return to Tiffin if needed for any initial repairs. Great choice of coach guys. We tried to buy a 44OH at a local RV show a little over a year ago. Same floor plan but with a large closet laundry room tacked on to the rear. We were told that there was an issue with the title/documentation that delayed us taking possession for a couple of weeks. Turned out that the coach had been sold to someone else. I never got the entire story but after finally telling us the coach was not ours the other deal fell through. Even though the coach never left the dealer they eventually had to sell it as used and it sat for many months. In hindsight I wish we had pursued it further. It was a great deal. We didn’t love all of the color choices but the price was amazing. If we ever decide to go full time the Phaeton would be my choice. We really love our 36LA but the Phaeton is another level of nice. Congratulations on your choice! I could have pursued it but we really didn’t want a tag axle rig and had trust issues with the dealer. But the show price was crazy low. Pardon me if you already mentioned it but which dealer are going through? I talked to Sherman briefly about a year ago and would likely go with them if I was to order a coach. Good luck with the IH. Love the color choice. We ordered from Rick Osburn at Marlin Ingram RV. Yeah, too bad the timing just didn’t quite work! We arrive on 9/6 and our build starts on 9/7! We’re somewhat newbies , second coach in just a year – winnie was a problem coach!! Wow, what a great looking coach. Love the color scheme. Lisa and I are so happy for you and hope to cross paths again so we can see ooh and ahh in person.